THE GREATEST TARANTULA EXHIBITION ON EARTH. and check out the awesome video of last years exhibition. Please note that the members website is not linked to the membership database. It may send you an email saying you have lapsed or your password has been updated. This may not be the case. If you have recently renewed online or at the BTS Exhibition you may get an email stating that your password has been updated. Your password will be reset to the default if you change it during the 2018-19 membership period. We have recently received a few emails and posts on Facebook asking why members who renewed or joined at the BTS Exhibition in May 2018 have not yet received any journals. I have outlined below exactly how the BTS Membership runs. Until a few years ago we ran a rolling membership but this proved difficult to maintain. The admin team were constantly sending out journals and trying to keep track of dates on the database. It was decided that in order to streamline the membership administration we would change to a yearly membership. Everyone is now due to renew at the same time (at the BTS Exhibition in May). If you renew at the BTS Exhibition (when most of you do. Thank you! ) you will receive before the next BTS Exhibition 3 BTS Journals and then be due to renew again at the next BTS Exhibition. Problem may occur if you renew half way through the year or before the cut off time for this year (1st of May). In this case in order to maintain continuity you may receive all journals for that membership year and be due to renew again at the BTS Exhibition. 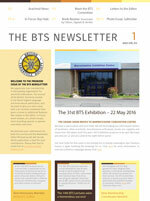 3rd Journal Publication date: April including renewal notice to renew at the BTS exhibition. We are sorry if this has led to confusion or that it has not been properly explained but hopefully this will help. The BTS is the world’s oldest on going tarantula society. The BTS Members website: Password and username protected B.T.S. Members area. B.T.S. Members area where you can download the latest journal and many back issues. Most online journals are enhanced versions. There are also articles and species listings and a “beginner’s questions and answers” matrix. 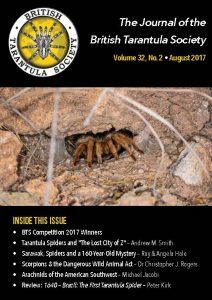 If you would like to view this area then use the “how to join” to find detail’s on how to become a full or web only member of the British Tarantula Society. Complete the membership form and return it to the head office. The forms carry all the information needed to join today! We appreciate your membership in the leading organisation for arachnid enthusiasts. Our Journal of the British Tarantula Society is the finest English-language arachnocultural publication, and we want to give you even more with a bi-monthly newsletter that gives a home to additional features such as Letters to the Editor, In Focus, book reviews, art, photo essays, short breeding reports or species overviews and more. We welcome your submissions for both the Journal and the Newsletter. The Editor will decide which publication is best for your contribution. Please feel free to email him at editor@thebts.co.uk.